Empowering potential and equality through growth, innovation and community support. Spiral will achieve our goals by providing a holistic support through cooperation, sustainability and being the provider of choice for people on the Sunshine Coast. Our Valuing Communities and Valuing Individuals (PDF 404KB) brochure is available for download. 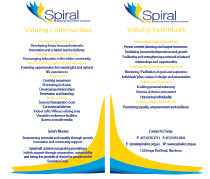 If you are unable to download this brochure, please contact Spiral for assistance. Contact Spiral today for further information.